Speaking from the scene just before midday on Tuesday, the Paris prosecutor Rémy Heitz said there was nothing to indicate a deliberate act. Read more: Notre Dame cathedral: Why is it considered a historical and cultural gem? French Prime Minister Edouard Philippe was due to chair a meeting of senior ministers to draw up a plan to reconstruct Notre Dame. The premise that the fire may have been started accidentally and be linked to the building work “is the focus of attention among the investigators,” the AFP news agency quoted a source as saying. It’s believed that the fire may have begun high up in the cathedral, below the roof. Workers involved in the restoration were interviewed by investigators overnight. They are all said to have finished work for the day and had left the site before the fire took hold. Work had been underway to restore the spire and roof of the cathedral, which were destroyed by the flames. This was the first phase of a major restoration project due to last several years, costing tens of millions of euros. Notre Dame Cathedral had been known to be in a bad state. An urgent appeal for funds was launched last year after cracks appeared in the stone. The damage extended beyond decorative elements such as statues, and there were fears for the stability of the whole structure. Begun in April 2018, the restoration project saw the cathedral encased in a vast network of scaffolding erected by Europe Echafaudage, a French company specialising in the restoration of historical monuments. Work has since been underway to clean the edifice from the effects of years of pollution, organised by the Paris Cultural Affairs department. The fire tore through the ancient wooden structure of the roof, causing massive destruction. It’s thought it might be difficult to find material evidence that could help determine the cause. 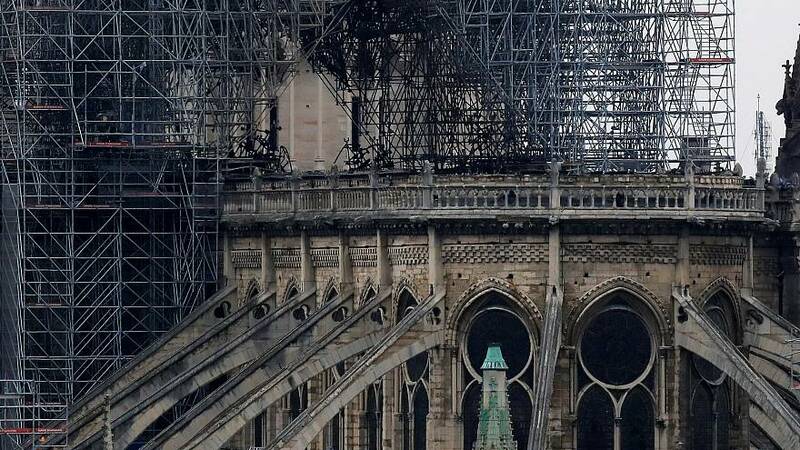 Suggestions that the fire may have been caused by welding work were reportedly dismissed by the architect responsible for the restoration of the spire, who said that such work had not yet begun. Questions have also been asked about whether fire prevention systems at the cathedral were adequate, and about whether enough resources had been allocated for maintenance. A spokesman for Notre Dame said fire detectors had been installed "all over", along with a computerised security system with 24-hour surveillance, according to France Info. Some prominent figures from the world of art have reacted angrily, in response to the scale of the destruction. "This is one fire too far," Didier Rykner, editor of the magazine "la Tribune de l'art", told the French channel. "The guidelines for work carried out on historical monuments were inadequate. I called for a law and nothing was done."